Ceibass Venture Partners – “Elect” to Vote! 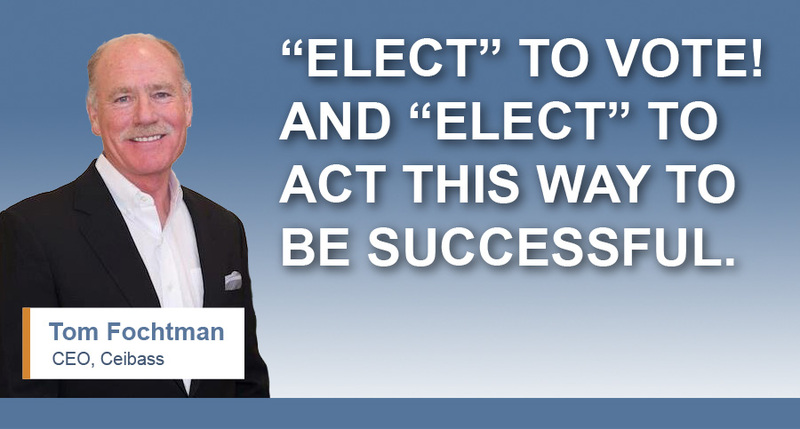 And “Elect” to Act This Way to Be Successful. It’s election day Tuesday, Nov 6th. We hope that you “elect” to get out and vote. Remember that democracy requires you showing up. You count. Your vote matters. Fundamentally, what you vote for are promises. Promises made by the candidates on how they will act if you vote for them. Candidates exchange promises for votes. Which got the enterprise value specialists at Ceibass thinking about what the ideal lawn and landscape business owners “elect” to take care of in their businesses? What do they “elect” to do with their limited resources – time, energy, money and lost opportunities? How do they “elect” to act to grow their businesses and make their companies attractive to a Buyer? Run their business with the intention to sell it one day. This puts them in practices that are consistent and coherent with growing an enterprise rather than having a job. Work on their business rather than in their business. This puts an emphasis on growing employees to take over the concerns of the business, rather than doing everything themselves. Meet regularly in a non-competitive peer group to develop and become aware of best practices for maintaining and growing their business. Take on the costs of keeping the business up to date with technology. Work to better their communities and neighborhoods along with participating regularly in the National Association of Landscape Professionals and other top organizations. Keep a close, hawk-like, watchful eye on contracts and contract renewals to make sure customer satisfaction is being taken care of. Always be inventing new services to existing clients to help grow revenues and maintain a competitive edge. Maintain the equipment so that it is always in top-notch shape. Watch their competitors to make sure they stay competitive and ahead of the curve in terms of new service offerings. Develop a strong management team that makes and adjusts projections and takes on initiatives to better the business. Bring in experts to help them improve their business practices and to help them increase their revenues. Have a strong idea of what’s next for them after they sell the business. Know how much money they will need in their retirement so that they can grow their business to a size that will provide them with the appropriate nest egg – after taxes. Again, we hope that you “elect” to get out and vote. Democracy needs you. Make the time.